Come to think about it, maybe the Virgin Mary, who appears on camera in several highly stylized and memorable scenes, actually blessed this debut effort by Mr. Veliz. Divine intervention or not, there's no denying that Rogelio T. Ramos, who plays the title character, Macario, puts an indelible face on the stereotype of the illegal immigrant. And Milicent Figueroa, who portrays the loving, left-behind wife, Regina, will break your heart given the impending "tragedy" that punctuates this story. The fact that the title gives away the ending is of no concern, as Mr. Veliz does a superb job of getting us to this point utilizing a variety of risky, but ultimately successful cinematic techniques which combine stark realism with a dream-like, almost mythical and magical series of scenes that in the hands of a lesser director would have been a disaster. Macario's decision to seek a better life by going to America, where a relative has promised work and good pay, is a fatal one. On more than one occasion the Virgin Mary materializes before him warning Macario not to go, but the despair and depravation he and Regina are forced to endure, especially once he loses his menial job working on a nearby ranch, along with the promise of making as much as $800 a month in the U.S., unite to form a powerful combination too tempting to resist. And so Macario, along with his best friend Felipe (Victor Agustin), find a "coyote" who promises to not only help them cross the border, but he'll personally welcome them on the other side when he unlocks the boxcar they, along with a dozen or so others, are being transported in. The lowlife coyote never shows -- all are asphyxiated. Consider yourself warned because these scenes depicting realization, then desperation and, ultimately, suffocation, will haunt you for some time. Special mention must be made for the wonderful music by Carlos Sanchez and Pablo Veliz, as well as the first-rate sound work by Dagoberto Patlan and Jeff Seale. Overall production values are excellent given the budget, with all technical elements such as cinematography and editing, etc. surprisingly solid, especially given the relative youth and inexperience of all involved. 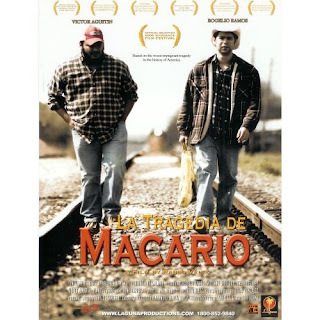 Accordingly, LA TRAGEDIA DE MACARIO has been selected for screening honors at Sundance, Worldfest-Houston, SXSW and numerous other film festivals. These accolades are well-deserved. Postscript: Living in the South Texas Hill Country affords one numerous supposed sightings of the Virgin Mary, in such widely divergent and unlikely places as in the center of a corn tortilla, the bark of a mesquite tree, the water stain on a Whataburger ceiling panel, a puddle of oil on the floor of a Jiffy-Lube or, most remarkably, on the surface of a diseased rutabaga. As a result, this reviewer hereby vows that if such a vision ever appears and the Virgin Mary is trying to warn him about something, like she did Macario, you can bet your bottom dollar yours truly will take heed -- all avowed agnostic beliefs notwithstanding.